Start by gluing all of your strips together into one loooooong strip. You can use any colors and lengths of strips that you’d like to achieve your desired look. Here I started with a 12″ strip of black in the middle, then I used 24″ strips (alternating turquoise and black). Keep in mind that shorter lengths will give you thinner rings in your bullseye design. Longer strips will give you thicker rings. Let your strip dry for at least a minute before rolling it up. Now it’s time to roll! I like using a slotted tool for ease, but you can use a needle tool if you prefer a super tiny middle to your bullseye. Use your fingers to steady the circle and keep it even as you roll it. Time to finish! With a circle this large I like to glue it before taking it off, or else it has a tendency to unravel while taking it off if you don’t hold it very carefully. So put a dab of glue, make sure it is holding tight (let it dry for a few seconds at least). When you take the roll off of your slotted tool, you want to make sure that the middle doesn’t unravel. I do that by holding my thumbnail against the tool while gently pulling it off. This makes sure the middle comes off of the tool smoothly. Now you have your bullseye! You can make them in any size and color pattern that you like. They can be used for magnets, frame decorations, jewelry, and more! Click here to view the tutorial for turning a small bullseye design into a pair of cute earrings. Making a spiral is a fun variation of a bullseye. You can use any color combinations that you want for a fun design! I just went with 2 colors for my example designs. If you want the spiral to be thin, use fewer strips, if you want it thicker (like in my next design) you use more strips. Start by putting a dab of glue at the end of each strip of paper and piling them on top of eachother. You won’t need glue on the strip that is on the very top, of course. Once you have glued them together in a stack, let it DRY COMPLETELY. If you do not let it dry completely, it can come apart when you start rolling it, which is very annoying (trust me, learn from my mistake 😉 I use the needle tool to start rolling it, but if you prefer you can just use your fingers. After getting it started on the needle tool I took it off to finish the rolling. When you get to the end you can trip the pieces as you wish before gluing each one down. When getting to the end the black strips were longer than the turquoise strips. I wanted the outside of my spiral to be all turquoise, so I trimmed the black strips to be shorter. Then dab a bit of glue at the end of each strip and smooth it down. You have your spiral! The skinny spiral is a fun design, but if you look at it from far away, it’s hard to tell that it’s a spiral. If you want a spiral to really stand out, the layers need to be thicker! But I didn’t want it any larger than my previous spiral. So I used the same amount of paper, but cut each in half. So I was working with 12 strips that were each 12″ long instead of 6 strips that were 24″ long. Start by gluing the ends of your strips together, just like for the skinny spiral. Again, wait until the glue is COMPLETELY dry before even attempting to roll your spiral! The thicker your stack is, the more important this is! I usually do a few, then let them sit for a few hours while I do other things, and come back to it later. Once your stack is dry, start rolling. I actually find it easiest to do this without any sort of tool with this thicker stack. Start with the tiniest fold you can make, and then roll it up! It might take a little while to get it started nice and tightly. Once you get it started, the hard part is over. When you get to the end you’ll notice that the inside color of strips is longer than the outside. You can just glue them all down like this if you wish. I wanted the outside of my spiral to be black, though, so I trimmed the inside turquoise color strips to be shorter than the black ones left over on the outside. You can see how I trimmed the turquoise strips in the photo on the left. I trim them to be different lengths so that they will glue down smoothly and not have a lump where they end. Then add a drop of glue to the end of each strip, smooth them down, and your spiral is finished! You can use your bullseye and spiral discs for many projects! They would look adorable adorning a frame, decorating a notebook, or as fun magnets for your fridge! Use them to color code table settings for a party, add to gift boxes, and more! One of my favorite uses, as you may guess, is using them for jewelry! Stay tuned for my next post showing how I turned these fat spirals into an adorable jewelry set. Until then, feel free to check out all of my other free tutorials HERE. *This post contains some affiliate links. If you purchase products through the Amazon links I get a small percentage (at no extra cost to you!). I only link to products that I believe in and love to use myself. Thank you for supporting my blog! thank u very much for the detailed tutorial. Thank U so much for sharing this ……….It was very useful. Great work…….Keep Up. How can u think so different designs? Vow!!!! I have gone to quilling class for a week for 2 hours. But this method was not thought. I just love this design. The 1st one is a regular one. Thank you 🙂 After you have been quilling for some time, the design ideas will just start to flow! When I started to learn quilling, I happened to stop by at your blogs and I loved them. They were easy to follow and very inspiring. I have been creating different quilling earrings and jhumkas since and I really want to thank you for sharing your techniques and learning. Keep going !! This is one of the earrings i have created. I would appreciate for you to see how you have helped and inspired people. Thank you for your comment, and for sharing. Your jhumkas are beautiful! I love your tutorials, they have answered a lot of my questions. I have appreciated them – please don’t stop. I was wondering if you have used any of the new foil papers that I just found-the problem I am seeing is that they are white on the one side. Hi Kathy – thank you for your comment. I have no plans to stop making tutorials 🙂 actually I just got some of the foil paper! You’re right that it isn’t very useful when used just like regular quilling paper. You can use it as a trim or as a flat piece. For example, as the outside edge of flower petals. Lake City Craft used to sell silver and gold trim papers that I used like that. They are not a daily used paper, but they have their fun uses. I am planning a post showing some fun things you can do with them. Thank you for answering so quickly. Yes that is a way they can be used-I will be looking forward to see how you use the foils. Can u show it’s through a video.???? Hi 🙂 I’d like to start doing videos soon! 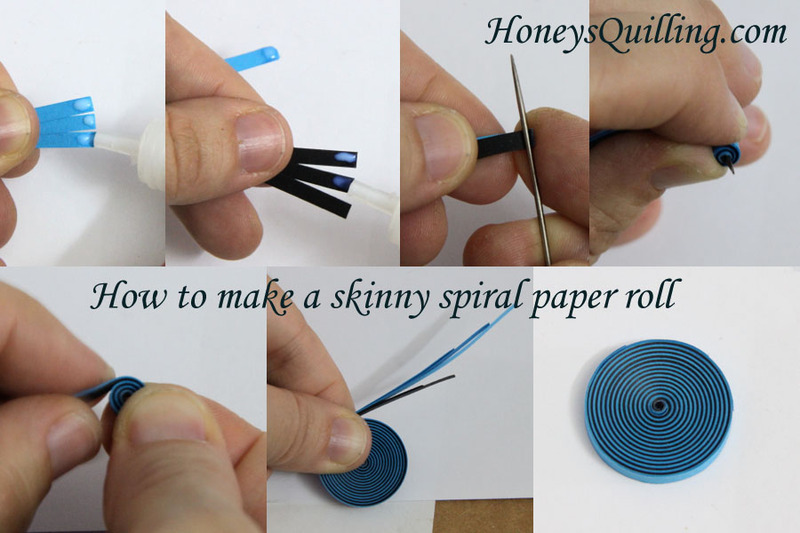 Do you sell quilling spirals already made? I have arthritis and it is painful to spiral paper strips myself. Thank you. Thank you for writing back. Yes, I’d be interested in purchasing pre-rolled quill spirals. What would the cost be?